I am a socio-technologist, an engineer trained to understand and build large-scale systems with both human as well as technological complexities. I am motivated to build socio-technical solutions that overcome constraints fundamental to improving human conditions in resource-poor environments, and am pursuing this objective at the intersection of Information Technology and Systems, Development, and Public Policy. I am a Senior Lecturer in MIT's Sloan School of Management, and serve as the Academic Director of MIT Tata Center for Technology and Design. I am also a Visiting Professor at the Indian Institute of Technology Bombay. to deeply understand the challenges of resource-constrained environment; (b) to research them rigorously and arrive at a scalable solution, whether technology or policy; and (c) to create a practical implementation plan for the solutions. I teach System Dynamics Modeling courses in various settings. The course introduces methods intended to enhance systems thinking, to represent and assess situations where business and policy decisions confront such dynamic complexity. Students learn a flexible and powerful simulation and modeling approach—System Dynamics—to structure managerial or policy problems and visualize the interconnectedness of business or social systems. During the course they work through the challenge of structuring and modeling markets, business and policy problems. In addition they examine cases of models where such techniques have been used successfully for making business decisions. This course focuses on learning techniques from Network Science to understand the properties of any network, including ones created by the Information and Communications Technologies. ICTs reconfigure the information architecture of a society or an organization by connecting people in a way in which they were not connected before. Students learn the fundamentals of network science, and apply it hands-on to real datasets to study their network properties such as size, density, clusters, and others. In some version of this course, they also engage in producing novel datasets. My research and action focuses on the intersection of technology, development, and policy. I see them organized as shown in the diagram. 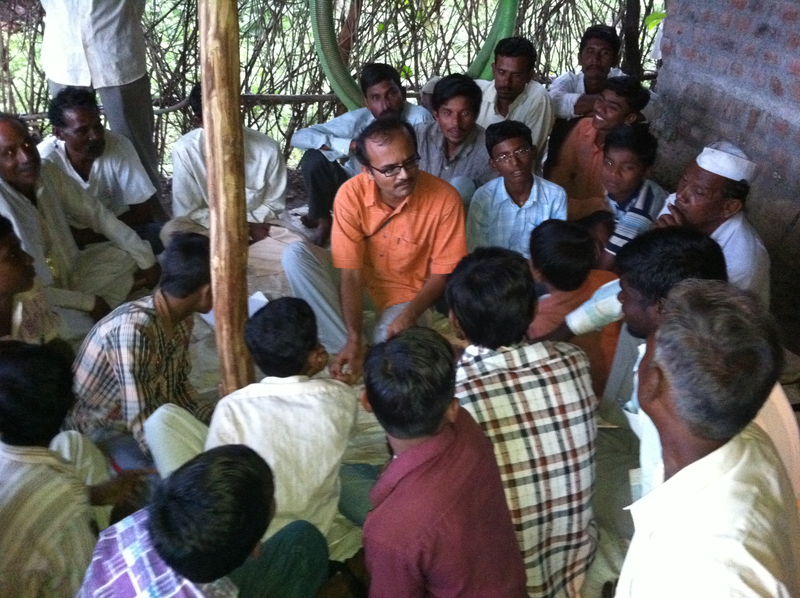 My quest to build socio-technical solutions for underserved communities has led to research in two interrelated work streams: Information Architecture for Development, which attempts to build solutions centered on new forms of information generation, sharing, and decision support for the resource-poor communities in various domains such as agriculture, water, urban governance; and Understanding the Dynamics of Disruptions, which attempts to understand the context within which the Information Architecture must be built for it to create the necessary technological, industrial, and regulatory disruptions for the desired change, and how managers, policymakers, and the society at large can manage such a change. 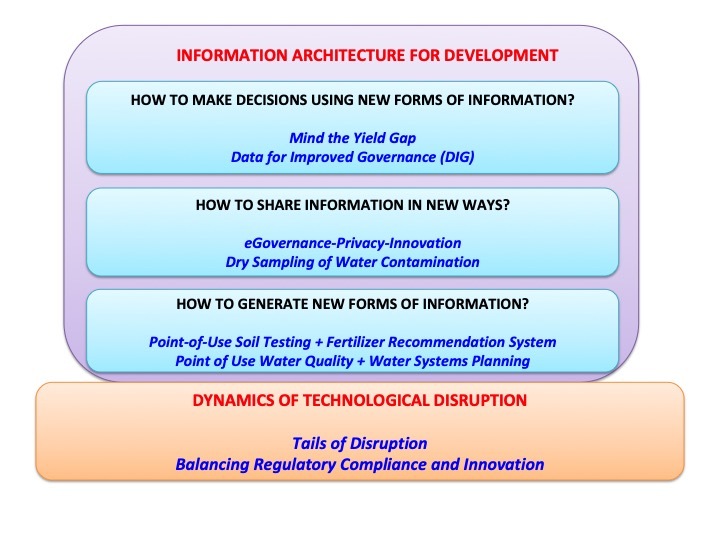 The work stream Information Architecture for Development comprises (a) novel low-cost sensors that generate information to improve food and water security (e.g., soil nutrients measurements, water quality detection); (b) novel approaches that share the information generated (e.g., paper-based sensors used by postal services); and (c) novel institutional mechanisms and capabilities that act upon the shared information (e.g., recommendation systems for farmers, village water and sanitation workers; and decision support tools for government agencies working on water, sanitation, and for cities to manage governance efficiency and citizen privacy). 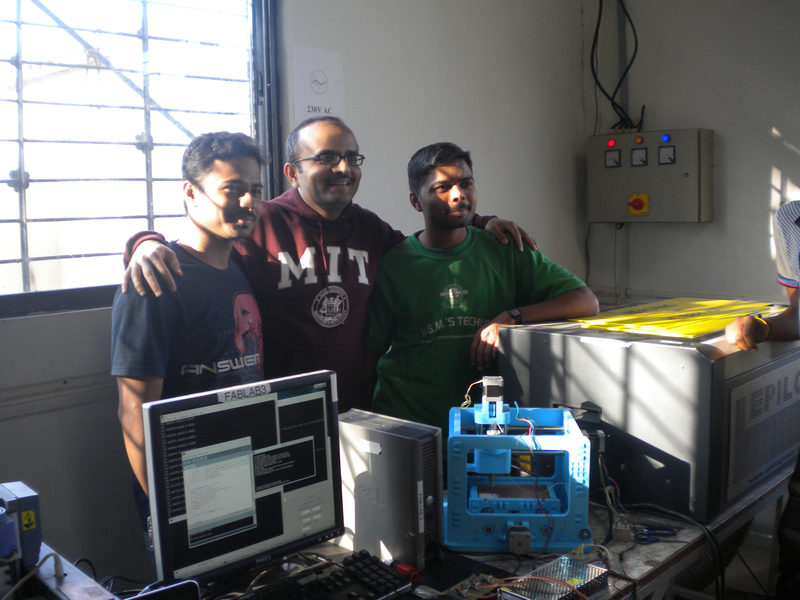 Along with collaborators in MIT Mechanical Engineering, Electrical and Computer Engineering these projects are conceptualized from the perspective of socio-technical system to cover both technology and the large-scale system that surrounds it. This work has generated several provisional patents. Presently, projects on soil testing, planning of water and sanitation systems, and urban governance and privacy are being translated into field implementation via start ups, not-for-profit organizations, or the governments. 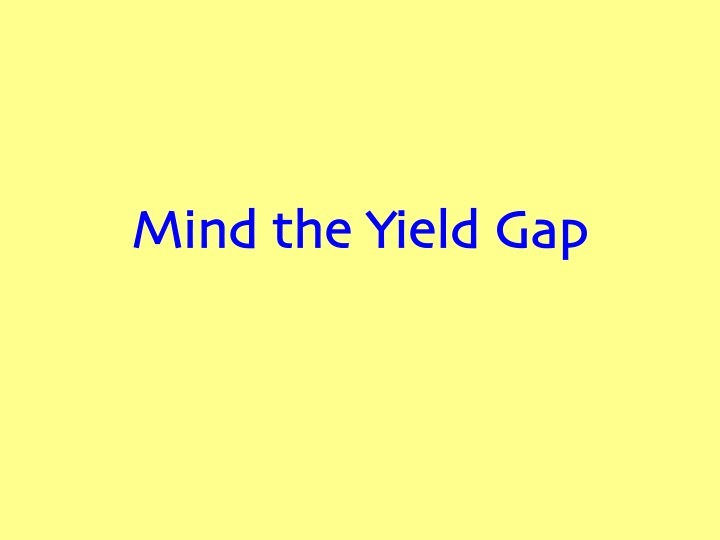 The work stream Understanding the Dynamics of Disruption builds upon the work over the past decade, where I have developed a system dynamics based general model of disruption that illuminates conditions under which disruptions do or don’t occur. In collaboration with leaders of the communications industry, we have studied several disruptions such as voice over IP, audio, video, news, wireless telephony, location based services etc. 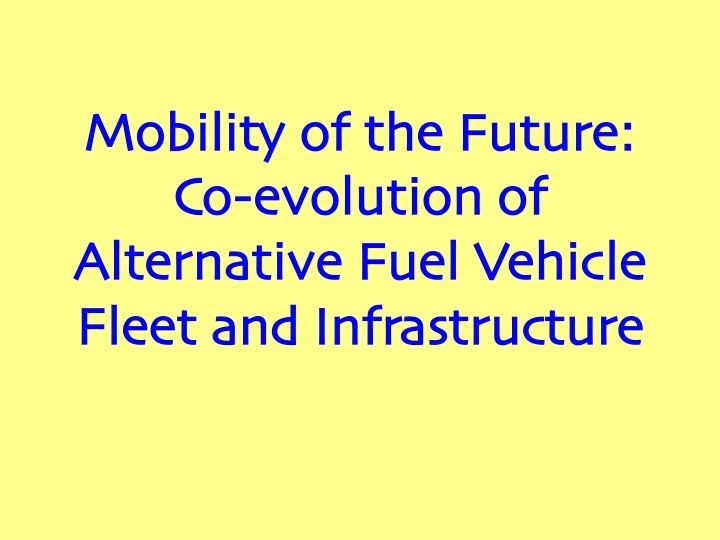 Today, this work is being extended to the future of mobility. An equal focus of this work has been on the regulatory response to technological disruption; in particular, how to achieve the necessary regulatory compliance without killing innovation as the new technology displaces the existing one. This work has found use in decisions at the Office of Science Technology and Policy (OSTP), at the White House; US Federal Communications Commission (FCC); and Telecom Regulatory Authority of India (TRAI). I seek to do research that has promise along two dimensions: an opportunity for significant contribution to scholarship, and a potential for large-scale impact. Presently, the following projects are beginning to translate into field-level testing, implementation, or collaborations. QuantiSoil: We are in the process of early stage field test of our soil sensor. 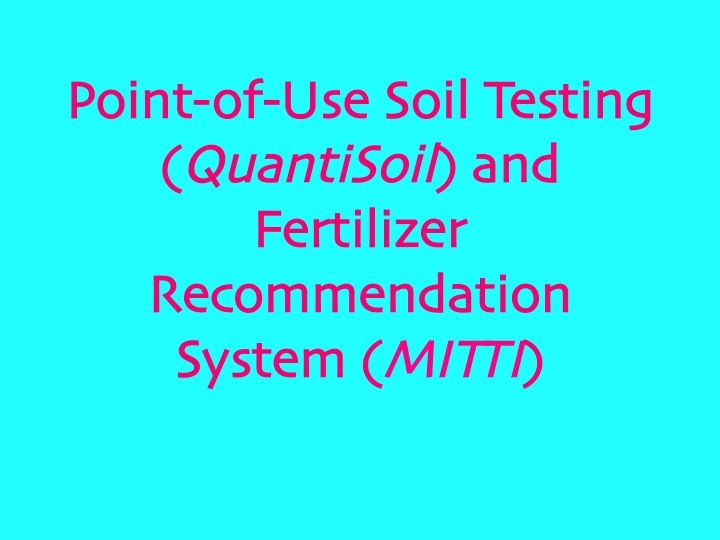 MITTI: We are in the process of turning the soil recommendation part of the solution into a startup. eGovernance-Privacy: This work has produced two indices being implemented at city-level: Governance Efficiency Index (GEI), which is a measure of how timely and accurate are the citizen services of a city; and Information Privacy Index (IPI), which is a measure of how “right” is the data collection, use, and disclosure of the citizen data from the privacy perspective by a city. Data for Improved Governance (DIG): This work has turned into an annual fellowship at Ahmedabad University to produce Decision Support Tools for the government, private sector, and civil society actors working in the Water, Sanitation, and Health sectors. Over years, I have had the opportunity to collaborate with many academic, industry, government and civil society organizations. At MIT, I presently collaborated closely with researchers at Advanced Network Architecture, and Internet Policy Research Initiative at CSAIL; Microfluidics and Nanofluidics Laboratory, and Mechanosynthesis Group at Mechanical Engineering. In the past, I have been a part of Program on Emerging Technologies, and Explorations in Cyber International Relations. I also collaborate with researchers at Ahmedabad University, Indian Agricultural Research Institute (IARI), and International Crop Research Institute for Semi Arid Tropics (ICRISAT). 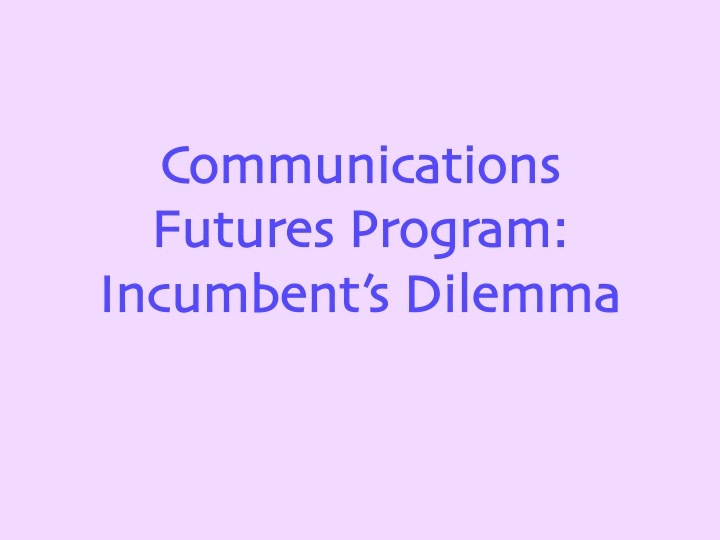 Over the last decade, I have had an opportunity to work with and advise incumbents of communications industry through MIT’s Communications Future Program. Presently, a similar study is underway for the automotive industry through MIT’s Mobility of the Future. In the government sector, I have had an opportunity to advice policymakers in USA and India. On Internet and Telecommunications policy, I have advised the White House’s Office of Science Technology and Policy (OSTP), Federal Communications Commission (FCC) in the USA, and Telecom Regulatory Authority of India (TRAI). In the area of innovation policy, I have advised the NITI Aayog, India’s central planning agency, and Government of Gujarat, India. Finally, my work has been possible because of many excellent civil society organizations such as Tata Trusts, PRADAN, Deshpande Foundation, Himotthan Society, Central India Initiative of the Tata Trusts. 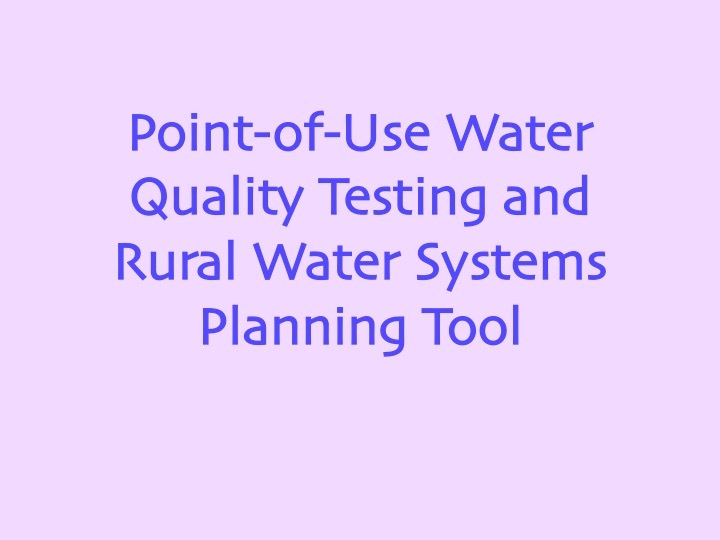 Method for Preservation, Transport, And Analysis Of Water Samples, US Application No. 15/497,761. Systems, Devices, and Methods for Point-of-Use Testing for Fluid Contamination, PCT International Application No. PCT/US17/57265. Chintan Vaishnav, Karen Sollins, Nikita Kodali, “How Public Should Public Data Be: Privacy and E-Governance in India,” Telecom Policy Research Conference Washington DC, 2018. Ron Rosenberg, Michael Bono Jr., Soumya Braganza, Chintan Vaishnav, Rohit Karnik, A. John Hart, “SoilSense: In-Field Determination Of Soil Ion Content Using A Handheld Device And Screen-Printed Solid-State Ion-Selective Electrodes,” PloS one 13 (9), 2018. E. Hanhauser, M. Bono, C. Vaishnav, AJ Hart, R. Karnik, “Dry Preservation Of Heavy Metal Contaminants In Water Samples Using Cation Exchange Resins For Improved Water Quality Monitoring” Abstracts Of Papers Of The American Chemical Society 256, 2018. Bono, Michael, Sydney Beasley, Emily Hanhauser, John Hart, Rohit Karnik, and Chintan Vaishnav. 2017. “Fieldwork Determination of Design Priorities for Point-of-Use Water Sensors for Use in Resource-lImited Environments” presented at the Pittcon, Chicago, IL. 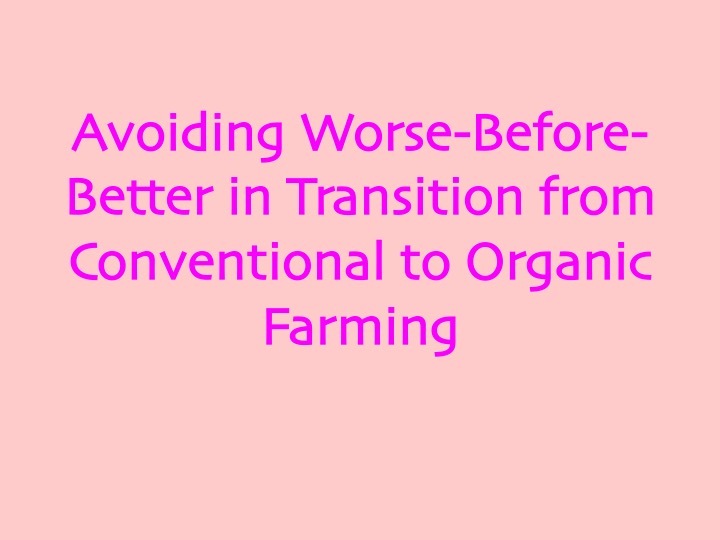 Sarah Nolet and Chintan Vaishnav, “Can We Avoid Worse Before Better in Transitioning to Organic Farming?,” International Conference of System Dynamics, Delft, Netherlands, 2016. Chintan Vaishnav, ‘Information Flows in the Traditional Knowledge and the Grassroots Innovations Value Chains for Agriculture - A Report from Gujarat,’ submitted to the Government of India, 2005. Chintan Vaishnav and Johannes Bauer, “Effects of Policy on Competition in Telecom Equipment Markets: Insights from a Multi-level Multi-method Study ,” Telecom Policy Research Conference, Arlington, VA, 2016. Chintan Vaishnav, Nazli Choucri, and David Clark, “Cyber International Relations as an Integrated System,” The International Engineering Systems Environment Systems and Decisions 33, no. 4 (December 1, 2013): 561 - 576. Chintan Vaishnav, Michael Sechrist, Daniel Goldsmith, and Nazli Choucri. “The Dynamics of Undersea Cables: Can the Old Modes of Governance Cope with New Demands of the Cyberspace,” International Conference of System Dynamics, St. Gallen, Switzerland, July 2012. Chintan Vaishnav, “Regulator’s Dilemma: How to Balance Compliance and Innovation as the Internet Disrupts Traditional Technologies”, International Telecommunications Society Regional Conference, New Delhi, India, 2012. Chintan Vaishnav and Pedro Ferreira, “Internet and Political Engagement: A New Integrated Model of Cyber-Democracy”, Telecom Policy Research Conference, Arlington, VA, 2011. Chintan Vaishnav, “From Herding Sheep to Herding Cats: Balancing Regulation and Innovation in the Modular Age of the Internet”, Technology Policy Research Conference, Arlington, VA, 2010. Chintan Vaishnav, ‘The Internet: A Case of How Government’s Involvement and Exit Influences the Creation of Global Standards,’ NSF PoET Working Paper. Chintan Vaishnav and Charles. H. Fine, ‘A dynamic assessment of VoIP innovation, adoption and their interaction with CALEA regulation,’ Technology Policy Research Conference, Arlington, VA, 2006. Chintan Vaishnav, “From Herding Sheep to Herding Cats: Balancing Regulation and Innovation in the Modular Age of the Internet”, under review at Telecommunications Policy Journal. (Originally published at TPRC 2010). Chintan Vaishnav, ‘Does Technology Disruption Always Mean Industry Disruption?,’ International Conference of System Dynamics Society, Athens, Greece, 2008. Chintan Vaishnav, A. Khakifirooz, et al., ‘Punishing by Reward: When Your Performance Bell-curve Stops Working For You,’ International Conference of System Dynamics Society, Nijmegen, The Netherlands, 2006. S. A. Abd-Elmalak, C. Vaishnav and A. P. Jayasumana, ‘Performance of Robust WDM Fast Circuit-Switched Networks with Token Passing in Control Channel,’ International Journal of Communication Systems, Vol. 15, pp 239-255, 2002. Chintan Vaishnav, Matt Nieberger, A. P. Jayasumana, and Jon Sauer, ‘Design and Performance of a Robust WDM Network,’ SPIE's International Symposium on Optical Science, Engineering, and Instrumentation 1996, Aug. 4-9, 1996. Tarek El-bawab, Chintan Vaishnav, Anura P. Jayasumana, Henryk Temkin, Jon R. Sauer, and Heinz A. Willebrand, ‘Medium Access Control Protocols for Robust Wavelength Division Multiplexed (WDM) Local Area Networks,’ Proc. International Communications Conference (ICC)'96, v. 2, pp 1099-1106, June 23-27, 1996.